"Let's golf again, like we did last summer. Let's golf again, like we did last year." And the year before that, and the one before that. Yeah, you know what? We've all been golfing a bunch at this point, and it will take more than new courses and made-up golfers to get us excited. Something new, like 3D, for instance. That should make it all OK. Except, how shall I put this, it's already apparent to all but inexhaustibly excitable folk that merely adding three-dimensional depth to something doesn't instantly make it better or mask its inherent mediocrity. And that's the issue we're facing with Gameloft's debut downloadable 3D offering. At its core, it has the same rather run-of-the-mill mechanics of the previously available DSiWare (and mobile phone) versions, albeit beefed up with two extra characters and six courses, double the number previously available. With 108 courses and tons of customization unlockables, you can't knock it for content for $6.99. That said, the mechanics feel a little too lightweight for the game to be interesting, and traipsing around the courses rarely feels as challenging as you'd expect. When taking long shots, it feels too easy to get the exact power and accuracy you require, while the short game has precisely the opposite problem. Even so, Birdies and Eagles come thick and fast, and having to call upon your character's rechargeable skill shot (to enhance accuracy or power, or kill the wind for a shot, for example) rarely seems necessary. The addition of 3D, meanwhile, is as superfluous as you might suspect. On long shots it gives the novelty of added depth, but on the short putts, it can actually be a complete nuisance, with the character model's head clipping through the view. 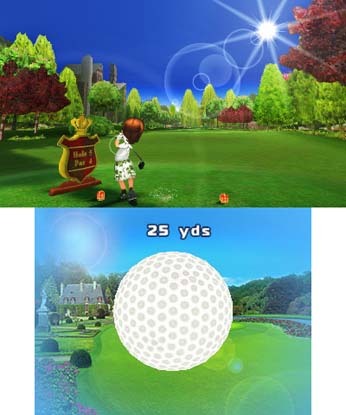 One positive note about Let's Golf 3D is that it's the first title to take advantage of Nintendo's new expanded file size limit. With this weighing in at a reported 190MB, more ambitious offerings could be on the way. Unfortunately, Let's Golf 3D isn't one to get overly excited about, and in a market drowning in rival offerings, you won't have far to look to find a better one. What's Hot: More characters, 108 courses. What's Not: Too easy, 3D gets in the way, unnecessary skill shots.